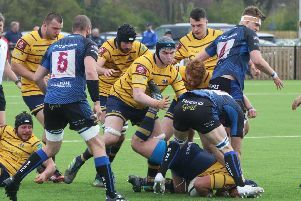 WORTHING Raiders Rugby Club touched down seven tries as they eased to a 46-5 win at home to Cornish All Blacks in National 2 South this afternoon. Alex Wilcockson touched down a hat-trick, with Sam Aspland-Robinson, Thomas Margetson and Sean O’Hagan also going over after Raiders’ opening try was a penalty try. Raiders scored three tries in the first half to lead 22-5 at half-time, before they ran in four unanswered tries after the break in an impressive performance. The win was Raiders’ third on the bounce, after an opening-day defeat at Clifton.